To date Rough Rider only offers the Slimline Congress in white smooth bone. . I've also heard the pattern called a Gentleman or Court House Congress. The Slimline have slim concave handles with blades that are well recessed into the handles and is popular pattern among whittlers. I actually prefer the high rise pattern that have a thicker concave handle with wider sheepfoot blades that form noticeable bumps above the handles I've seen this pattern called a High-Rise Congress. People who like the Slimline Congress pattern should be very pleased with this one. The blades have good walk and talk and are easy to open. 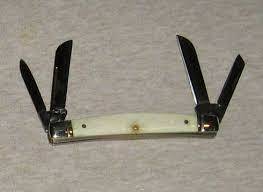 Traditional congress blades are also present (Two main sheepfooters, a pen and a coping). I give Rough Rider high marks for keeping the standard blades in place and also the quality of build. Here’s hoping Rough Rider comes out with a High-Rise Congress also with the same blade choices for people like me, who prefers heavier blades. Rough Rider makes the Slimline Congressin almost every pattern and handle material.